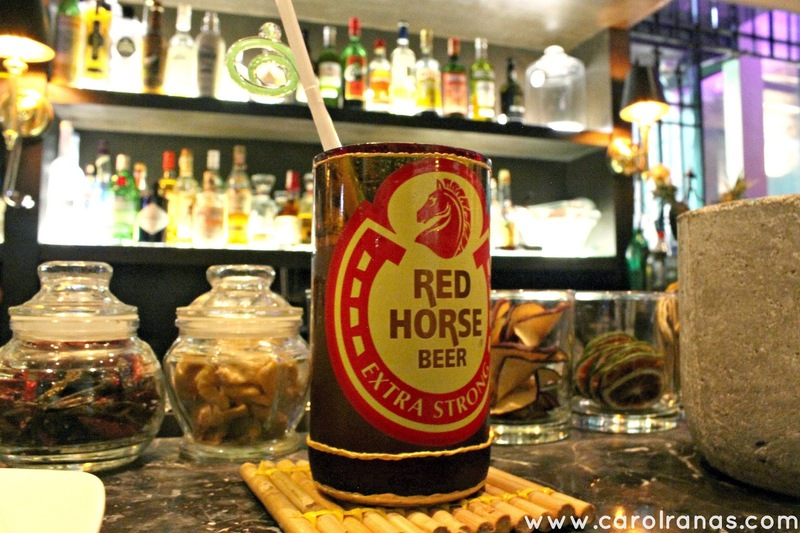 "Every hardworking person deserve a good drink after a stressful day at work". 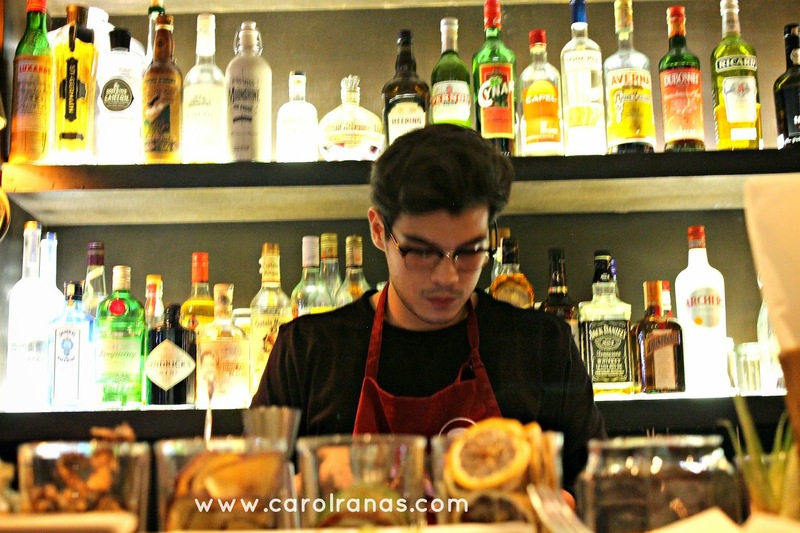 Niner Ichi Nana is one (of the many) restaurants that Erwan Heussaff owns. 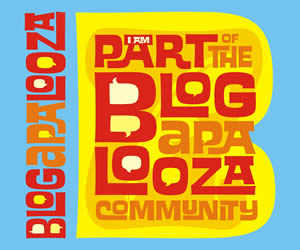 Erwan is known for his blog, The Fat Kid Inside and also the beau of famous celebrity, Anne Curtis. Erwan usess a hands-on in terms of managing his restaurants. 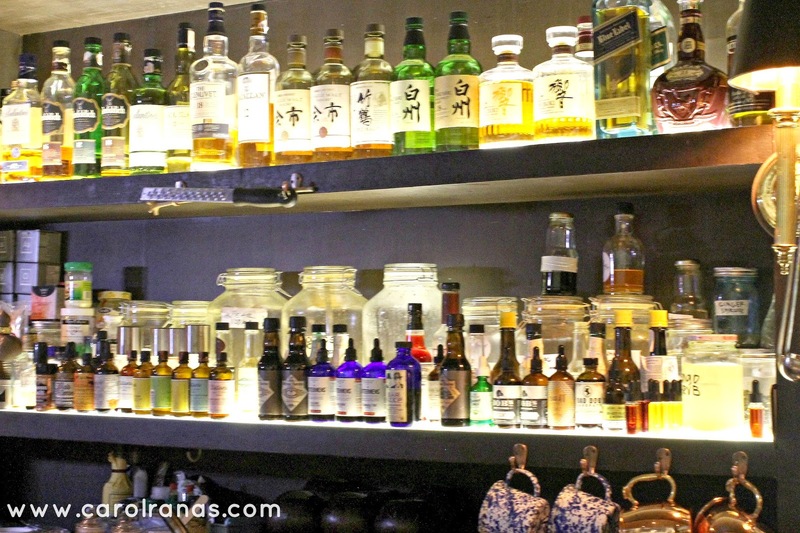 And Niner Ichi Nana turned out to be an interesting cocktail bar with a wide array of unique ingredients. A combination of different types of bitters, unique ingredients like dried (hydrogenized) fruits, herbs, flowers and barks will welcome you at the bar. 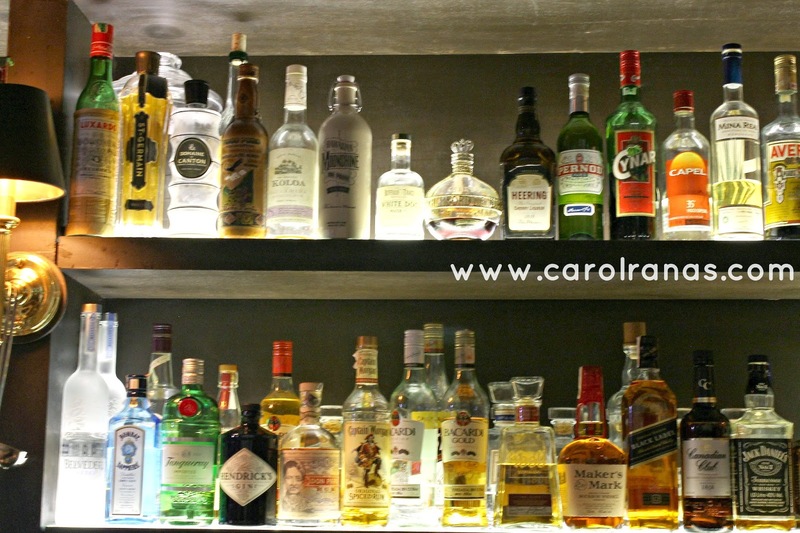 All liquor base are top shelf so they'll be crafting your drinks based on the best liquors available. 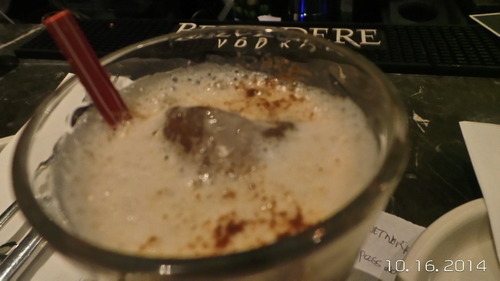 Last October 16, I was able to try the Craft Series: Pulutan. We were served a combination of "panulak" and "pambara" that resembles to what the people are accustom to every "inuman" session. Their Legit Sisig comprises of minced pork face, liver and brain with onion, chili and calamansi arranged in a small plate.  I just tasted a bit of it and pushed it aside. I'm not a fan of pork innards but Soshi enjoyed munching on them (well, except the liver part which didn't receive much love from the both of us). Niner Ichi Nana's Tokwa't Baboy is made of silk tofu croquette, pig ears with soy vinegar foam, arranged creatively in a small plate. 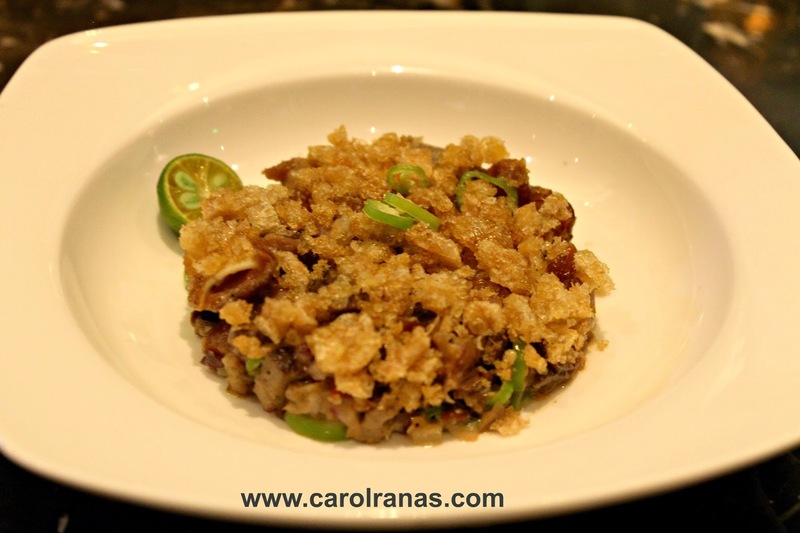 This is an upscale take on our Filipino favorite, Tokwa't Baboy. It tasted more like a tofu croquette in my opinion. 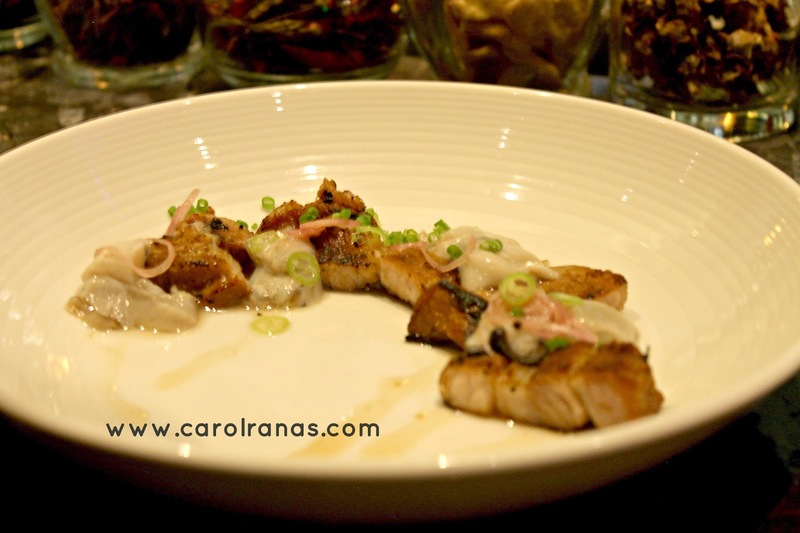 This dish consists of charred pork belly, siling labuyo, and shallots mixed in cane vinegar. It reminded me of Vigan's sinanglao sans the soup. This was my favorite pulutan that night. 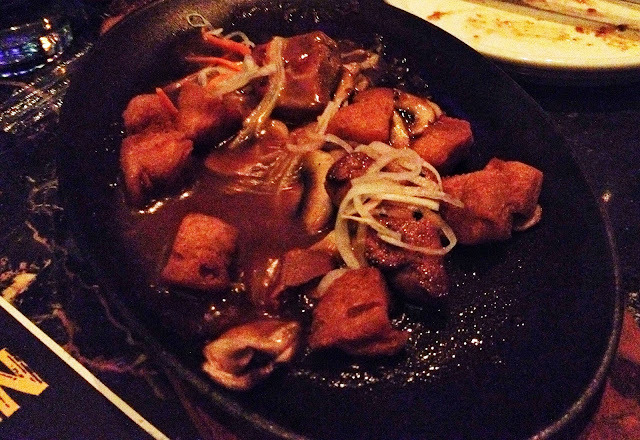 If you're feeling a bit fancy, you have to try their Sizzling Foie and Shrooms. 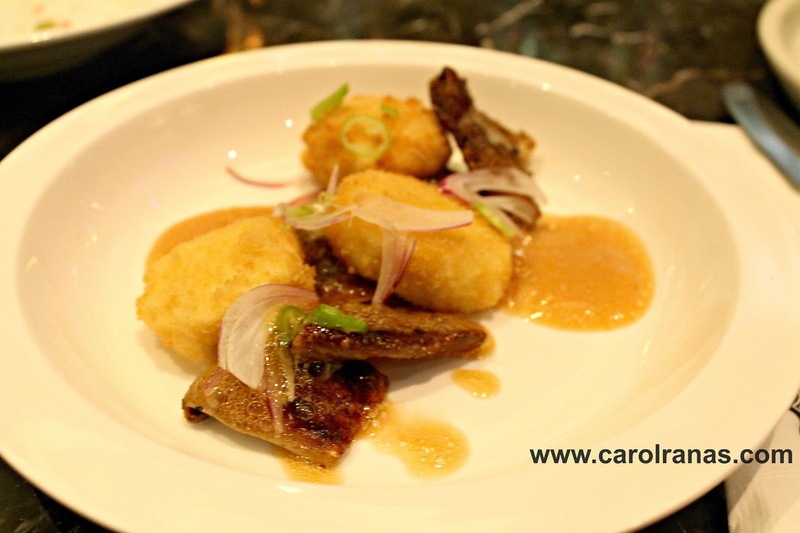 It's a mix of Foie and Mushrooms with pickles, pan de sal croutons swimming in a la pobre gravy. 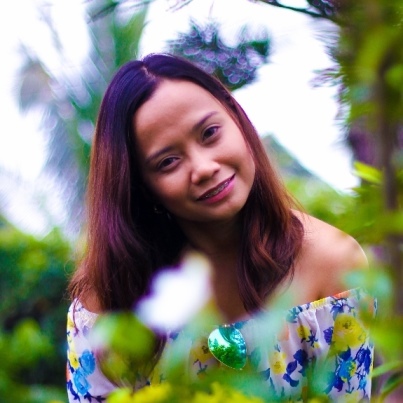 I was taken aback at first when Erwan gave me a bottle of their drinks. My expectations were the drinks are made in front of you. 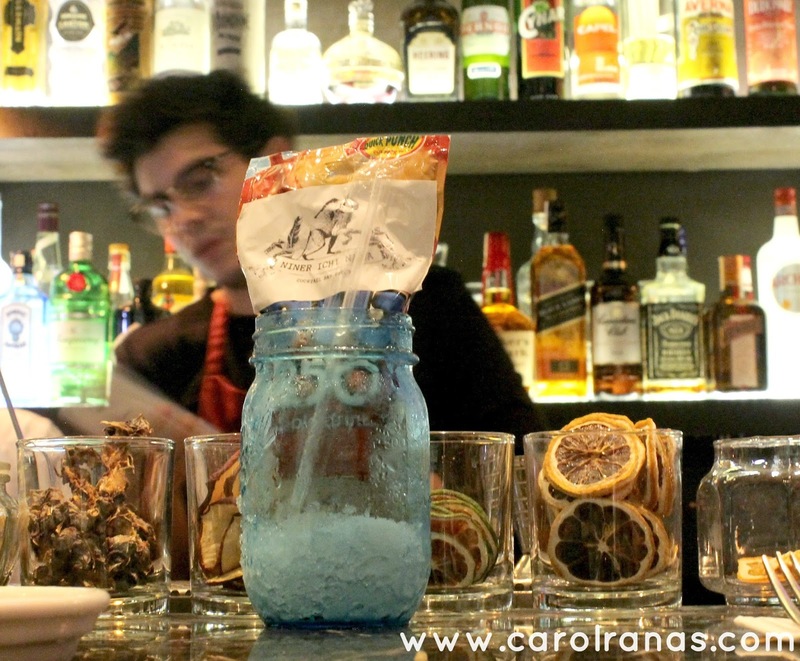 But Erwan explained the concept of infusions which allows the flavors of the ingredients to mix with alcohol which gives it an interesting flavor combination. Infusions were a bit new to me, especially in the alcoholic drinks department. Once it reached my lips and flowed down my throat, I know that it was something I couldn't turn my back on. 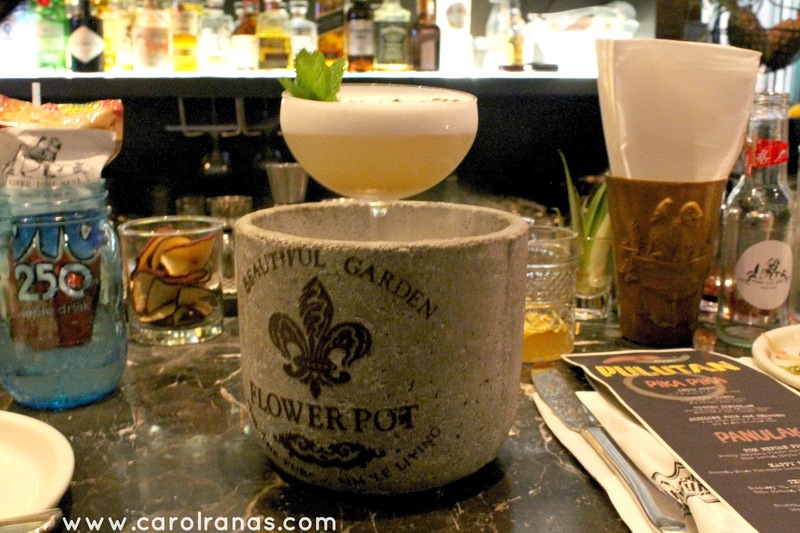 The drink consists of Pomelo shrub, elderflower, mint leaves and simple syrup infused with Bombay Sapphire. The drink has that sour taste with an interesting character. The flavors were intermingling inside my mouth. I easily finished this drink that night. 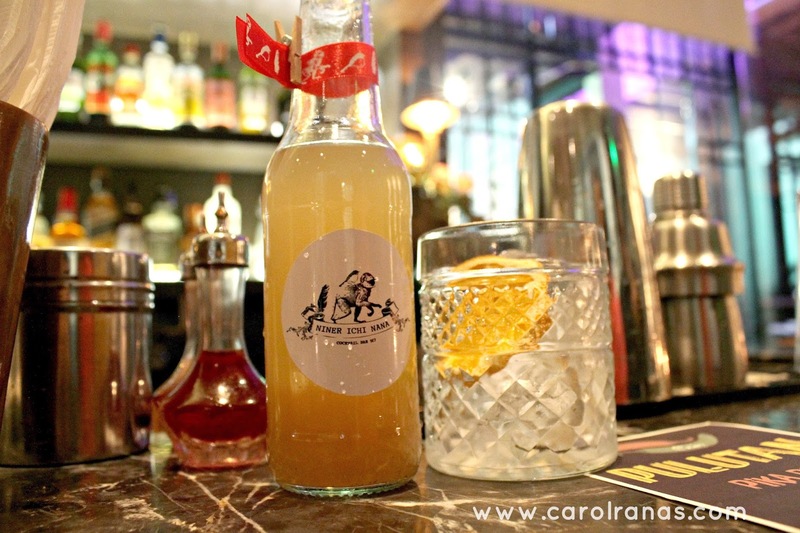 Happy Horse is a mixture of House Pineapple Lemon Soda, Cointreau, Paulaner and Bacardi. It has none of the bitter aftertaste of beer, but just unique flavors making love inside your mouth. Soshi loved the Happy Horse and ordered another round before we left. This drinks was inside a juice tetra pack. We were wondering how to consume the drink, but as to what Erwan demonstrated, it is simply sipped down in the tetra pack, just like a juice. The drink is made of Jerry Thomas Bitters, Mango Puree, Orange Juice, Orgeat, and Lime juice infused in Bourbon. I never liked hard and dark liquors, but Traitor Tetra was good, I didn't mind drinking it despite the bourbon. As I was chatting with Erwan, he did mention that Niner Ichi Nana is known for crafting specialized drinks that will suit your tastebuds (also popularly known as Bespoke). 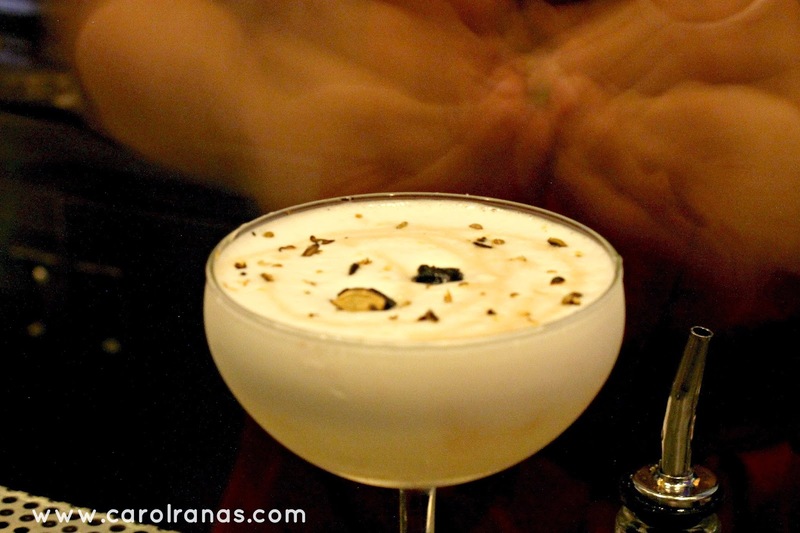 Bespoke is a custom drink that is based on flavors that you like. You get to pick your alcohol base, and which flavors you'd like to have it with. Overall, it was a fun night. I was glad because I learned new things about cocktails. Niner Ichi Nana certainly placed the bar high in terms of crafted cocktails. No more watered down and syrupy drinks or poorly mixed cocktails for me. I'll never settle for anything less. 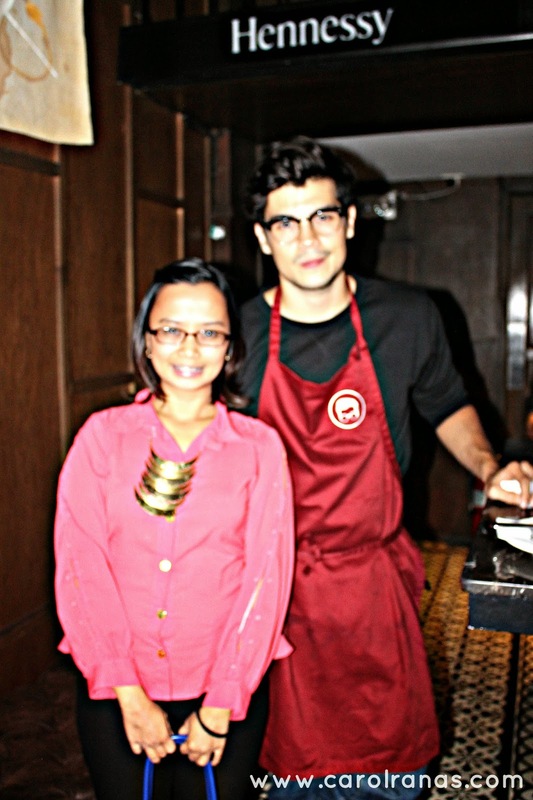 Not leaving without a pic with Erwan, even if it's blurry. Head over to Niner Ichi Nana tonight and join them for another round of drinks at the Craft Series.